Container Gardening: What Can I Grow in a Pot? 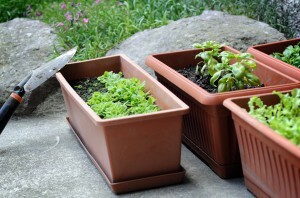 When you need a tomato or a pinch of fresh basil, nothing is more convenient than stepping out the kitchen door to your container garden of vegetables and herbs. Containers will go anywhere as long as there is a source of water and plenty of sunshine. You can grow almost all vegetables in containers—just remember that big veggies need big pots. All herbs. Any herb does well in a pot. All greens. Collards, lettuce, mustard, Swiss chard and others are perfect for pots. You can mix them with flowers for an ornamental touch. Lettuces yield a surprising amount. Pick only the outer leaves to keep the harvest going. Eggplant and peppers of all types make pretty summer pots. All tomatoes work in pots if the container is large enough and you have a good, tall cage or other support. Husky Cherry Red, Patio, Bush Early Girl, Bush Goliath, and Better Bush are especially easy to manage in containers. Cucumbers in a big pot can climb a trellis to save space. Even “bush” cucumbers climb. Zucchini and other squash work in large pots such as half barrels. Visit Argyle Feed & Hardware to choose your Bonnie Plant varieties for your container gardening project as well as garden tools, fertilizers, soil amendments, pest control and more! This entry was posted on Wednesday, April 6th, 2016 at 3:35 pm	and is filed under Garden, News & Updates. You can follow any responses to this entry through the RSS 2.0 feed. Both comments and pings are currently closed.